Toxic and combustible gases can occur in almost any industrial or commercial production area. 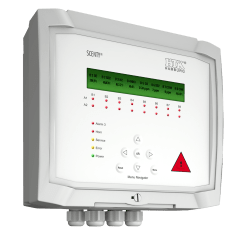 Scenty® gas detection systems reliably protect against the invisible hazards of dangerous and toxic gas concentrations, for example in the food industry, metal-working industry and in chemical processes. They are used, for example, in underground car parks in residential and commercial buildings and in monitoring the CO2 content in conference rooms. The sensors are designed for a wide variety of measuring ranges and types of gasses. They protect against the risk of explosion, dangerously low or excessively high levels of oxygen and the risk of poisoning. With our gas warning systems SCENTY® you increase the safety of your employees and meet the legal requirements for occupational safety, industrial safety regulations and accident prevention regulations. SCENTY® is manufactured according to the proven modular system of HTK HAMBURG. The systems can be used by 1-8 analogue sensors and in parallel as a BUS system. The generously selected display allows the user to capture all important information at a glance. Alarms, faults and operating states are additionally signaled via LED displays. A simple intuitive operation and menu guide also contributes to safety. The HTK HAMBURG® GMBH founded in 1978 is involved in the design and distribution of innovative and technical products which require declaration. In close cooperation with our partners, well-known universities and research centers, the HTK HAMBURG® continues to introduce innovative technologies to the market.